Obituary – Underside, Dennis Leroy « Perry High School Alumni Association, Inc.
﻿Memorial services for Lt. Dennis Underside, 25, son of Mr. and Mrs. Roy Underside, 405 Ivanhoe, who was killed while piloting a medium bomber over France January 29, will be held at 1 p. m. Sunday in the First Baptist church with Rev. James V. Gray in charge. Underside was a graduate of Perry high school, where he played football two years and lettered in wrestling. He received his high school diploma in 1937, and attended both the North Oklahoma Junior college at Tonkawa and Oklahoma A. & M. college, Stillwater. He was married July 15, 1941, to Miss Mary Frances Skirving, who is now living in Blackwell. Lieutenant Underside was born in Perry December 8. 1919, and in addition to his parents, a brother, Robert Underside. 17. a student at Phillips university, Enid, also survives. 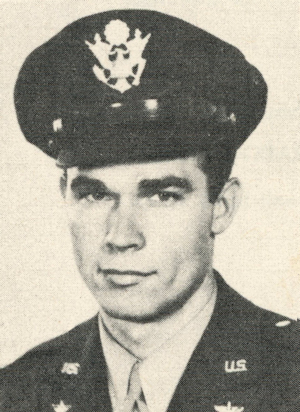 Dennis Leroy Underside, Second Lieutenant, U. S. Army Air Corps. Home address: Perry, Noble County. Mrs. Mary F. Underside, Wife, 425 East Paden, Blackwell, Oklahoma. Born December 8, 1919. Enlisted November, 1942. Decoration: Order of the Purple Heart. Graduated Perry High School in 1937. Attended Northern Oklahoma Junior College, Tonkawa, and Oklahoma A. & M. College, Stillwater. Member of Baptist Church. Graduated in advanced instruction at Blackland Army Air Field, Waco, Texas, in upper ten per cent of his class, and received wings and commission on April 15, 1943. Sailed for duty overseas in October, 1944. Died January 29, 1945, in action in France.